Verdict: 3.75 / 5Finally giving The Flash some new ground to work with, Issue 53 continues to focus on fun takes of old characters whilst building both a redemptive arc and a coping mechanism for Barry in an ever-changing landscape. The Flash continues on his mission to seek out all the unknown forces in his quest to understand the new, changing city that he has found himself in; in doing so he has run straight into one of those forces. Dealing with the fallout of the strength force bonding with The Trickster, both The Flash and Commander Cold work together to try to subdue this new threat. Not only does The Flash #53 feature some exciting action and the continued investigation of Iris West, but also finally reveals a little more about Commander Cold’s past and why he took the chilling moniker. Chasing after The Trickster is normally an easy feat but without his tricks he is somehow an even greater threat, relying on his brawn and muscle that the strength force has provided him. No longer the underdog villain laughed at by his peers, Trickster looks to redeem himself by taking down the Scarlett Speedster. But the same force that is giving him such power is also killing him. Unlike how the speed force successful bonded with Barry Allen, the strength force is ripping Tricksters body apart, relying on a sort of gravitational pull to give him his power. Returning to prison under the watchful eye of Wolfe, Cold and Flash work to save Trickster, although all does not go to plan. The main meat of this issue, however, was of course Commander Cold’s backstory. Elsewhere we continue on the subplot of Iris as she struggles with both her memories and her research into the new forces. Trying to help Barry as best she can, this subplot continues to move along slowly, although clearly with purpose. 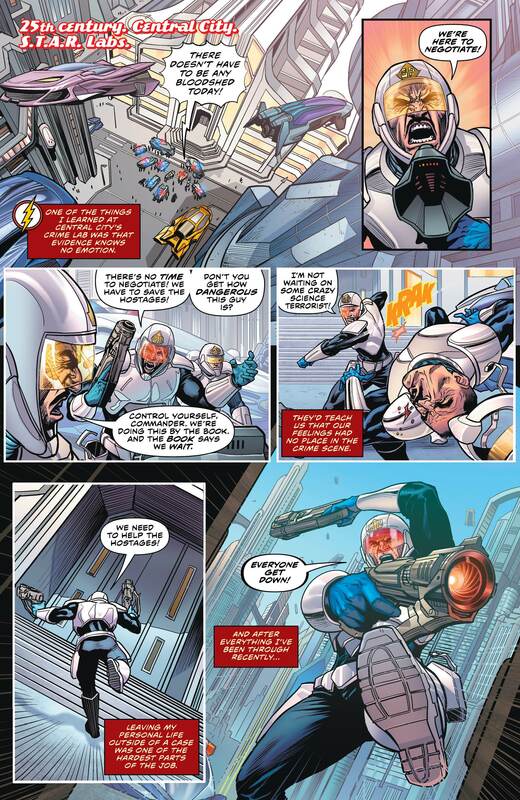 The main meat of this issue, however, was of course Commander Cold’s backstory. This new supporting player needed a proper origin and we find one in the form of a hostage situation gone wrong at the hands of the Elongated Maniac. Killing the madman in cold blood, this police officer is approached by a man of Justice, who creates the Renegades and grants Cold his title of Commander. It is this origin that helps us understand when Cold turns on both Trickster and Flash, wanting to kill them now that they have both been bonded with the strength force. Cold makes the decisions no one else is prepared to make and it’ll be up to Barry to show him the path and move him forward in a more positive direction. This issue set up a path of redemption that Cold is likely to follow; giving Barry a purpose again in the form of mentorship as he has done many times over. This battle with Trickster has been fun and the intrigue surrounding Wolfe and his character is ripe for more use in the future. However, the strongest element, as it should be, was the past of the Commander. The art was particularly on point during this issue, even giving a brand new design to our brief Elongated cameo. The writing also had some fun nods to the future, including Gorilla Ghost. The Flash #53, therefore, continues the good work put in place and shows us how Barry is to now cope with a changing world, by giving him another hero to teach the right path to once again.